The area bounded in blue on the map shows the area covered by flood alerts and warnings for Flint. 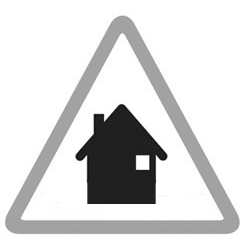 Properties at risk include the areas along the coast from Parkgate to Burton. This includes North Parade, The Parade, Quayside, Marshland Road, Denhall Lane. Areas at risk includes land at the head of the Wirral from New Brighton to Hoylake, and along the Dee Estuary up to Chester.